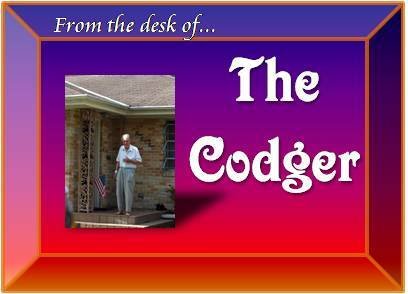 What are your favorite Codger moments to-date? What would you like to see The Codger write more about in this “lifestyle column”? How would I go about eliminating the competition? Share your thoughts in the comments box. Good morning and congratulations on your centenary, fellow! Thank you for helping everyone get up to date on your tremendous achievement. I had browsed the archive, but I missed a couple of these. Firstly, I have to say that your plan to destroy the Grand Coulee Dam is one that you-know-who in charge ought to take seriously, especially now since he’s all but ruined the Gulf and its food chain. I look forward to more posts about your home experiments, family, and political and historical analysis. Also, I find the live blog form to be especially captivating. A good morning to you as well, Mr. Charlie. First off, thank you for your support over the years. You know how it is: When you get older, suddenly society thinks that it’s just fine and dandy to start casting you aside and neglecting you. Thank goodness for the Internet, where we senior citizens can congregate and support each other and the senior agenda. You know what? You’re right–My plan for the Grand Coulee Dam should be followed to the letter by the government! And I should do another live blog one of these days. Since I still haven’t been able to secure a bee-proof Web cam, maybe I should live blog my bees’ daily activities. Or my own daily activities (on a non-colon cleanse day).